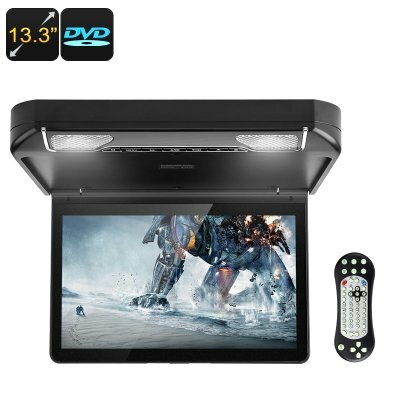 Successfully Added 13.3-Inch Car DVD Player - Roof Monitor, HD Resolution, HDMI, AV, USB, SD, Region Free DVD, Built-in Speakers, Rotating Display to your Shopping Cart. This flip-down monitor car DVD player makes sure that your passengers will never feel bored again. On its 13.3-Inch screen, this roof monitor allows the people in your car to watch DVDs, series, and even play 32-bit games. It offers the perfect way to pimp up your ride if you own a larger model car, van, or bus. This media player features a built-in DVD player that supports region free discs. This means that no matter where you’ve purchased your favorite movie, you’ll always be able to watch it with this amazing car gadget. If you are looking for a suitable way to entertain your children or passengers on the road, this car DVD player offers the ultimate solution. On its large display, this roof monitor portraits all your films and series in crisp 1366x768p resolution. Thanks to this, you’ll be able to enjoy all media in stunning beauty and undergo a cinematic experience straight from your own back seat. Besides regular DVDs, this car media player supports a wide range of other input functions. You’ll be able to insert your media through a USB or SD card. Additionally, this flip-down monitor comes with AV and HDMI inputs to connect it to external media players. Thanks to its wireless IR remote control, you’ll be able to easily browse through its features while comfortably enjoying the ride. This car DVD player features an FM transmitter through which it can play its audio via your car stereo. Thanks to this, you’ll always be able to enjoy great audio while watching a film or listening to music. Additionally, it comes with its own built-in speakers and it can be used with wireless headphones. The latter offers you an option to watch the movie or your liking without disturbing the driver and other passengers. Whether it is used for playing games, watching DVDs or listening to music – this car media system offers great on-the-road entertainment for young and old.